24/7 Wildlife is the bat removal specialist in Orlando Florida. We are centered in Orlando, but provide professional bat control for the entire state of Florida. 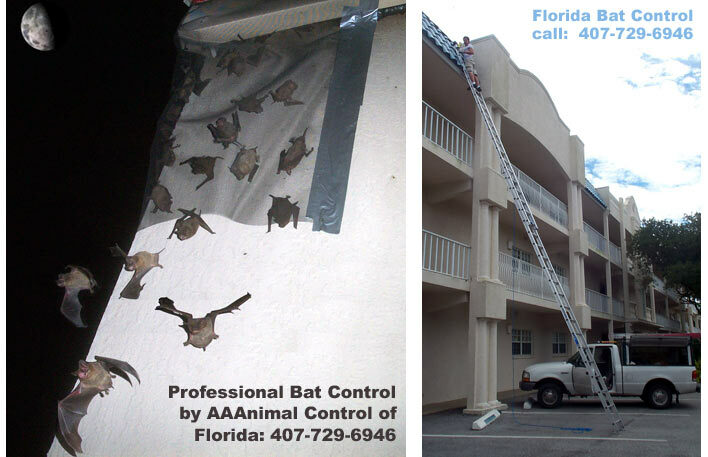 We are the leaders in bat control, and have completed several hundred bat evictions throughout Florida at a 100% success rate. My name is David, and I perform all of the hands-on specialty bat control work by myself - I would never trust anyone with less than several years of experience to do it correctly. Bat removal is a very detail-oriented process, and if done wrong, one can break the law, kill bats, create additional biohazard problems, or more than likely, fail to actually solve the problem at all. The most common scenarios involving problems with bats usually involve a colony, or large group, of bats living together inside the attic or under the tiles of a house. These colonies are often maternity colonies, or groups of females who are roosting together in an environment in which they can raise their young. Bats give birth to one young per year. If the colony is composed of Brazilian (Mexican) Free-Tailed bats, the maternity season begins in early June, when the female bats give birth. For more bat control information, go back to the bat control orlando page. 24/7 Wildlife is a professional wildlife removal company located in Orlando, FL. We are the leading experts in central Florida at solving conflicts between people and wild animals. We are fully licensed and insured, and dedicated to the highest quality of work. We guarantee all of our services, and not only do we remove the problem wildlife from your home or business, but we make sure to repair any damage that they cause, clean up the biohazardous waste that they leave behind, and seal all entry points so that no animals can ever enter your house again. Give us a call any time for more info. Those high-pitch sound machines don't work. Click for information on Ultrasonic Sound Machines for Bat Control.